“They were made for so much more,” is something Ryan Timmermans, a U.S. Army veteran now living in Carson, says repeatedly when referring to the millions of combat veterans suffering from Post-Traumatic Stress Disorder and battling to re-integrate into civilian life. 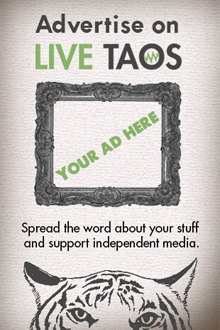 Depression, anxiety, panic attacks, insomnia, disability, failed marriages, isolationism, unemployment, homelessness. Every day in this country 20 veterans commit suicide. The Department of Veteran Affairs estimates that up to 20 percent of vets experience PTSD, but the healthcare workers at VA sites say it’s closer to 50 percent. Having fought in combat, soldiers who later suffer from PTSD sometimes return carrying survivors guilt and moral injury—the identification with how what they did violated their own conscience—ending up lost and unable to negotiate domestic life. The VA lacks the resources to handle the magnitude of trauma and mental illness they see in those people who actually come to their offices, which is not the majority. In Taos County, where 12.5 percent of our population are veterans, the one social worker responsible for all VA mental health patients was let go this October—so as of the publication of this writing, there’s no one to work as therapist to Taos’ 4,000 vets in the VA system. 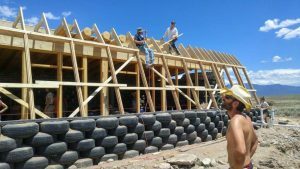 Ryan Timmerman working on his Earthship Academy Start-to-Finish Build in the Greater World Earthship Community west of Taos, July 2016. Photo courtesy Earthship Biotecture Academy. Enter Ryan Timmermans with a nonprofit organization in its grassroots stage called Veterans Off-Grid, designed entirely by him to help veterans repatriate in a way that actually makes sense of the dichotomy of who they are and what they’ve been trained to do. He’s drawn from community infrastructure models such as like Amish barn-raising and Habitat for Humanity, and filtered from his own experience of PTSD to glean what veterans really need to reclaim being whole. In a way, the development for his project began back in the summer of 2013. After being in the United States for eight months following his first deployment to Afghanistan, Ryan finally managed to lock down an appointment at the VA for help with his PTSD. The volunteer doctor had 10 minutes to talk with him and when Ryan walked out of the office, he decided that to heal he would have to start by going back to Afghanistan, “The last place my mind was healthy.” He went back as a private Army contractor in Psychological Operations and Intel. He stayed in Afghanistan for two years. 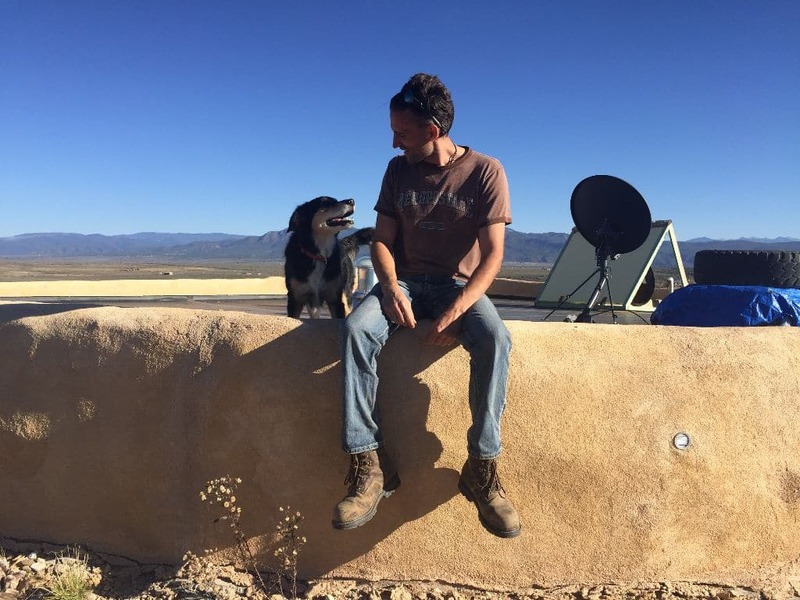 Coming back to the U.S., Ryan moved to Taos to study at the Earthship Biotecture Academy. He had begun to self-diagnose while in Afghanistan and started to piece together a map of his own healing that included a dream to live a simpler life, in the desert. He also saw how the camaraderie and bonding that soldiers develop during training and deployment, something necessary to functioning and survival, is stripped away upon return, and that the feeling of aloneness in civilian life had amplified his PTSD. Also, he says, “I took an oath to serve our country both abroad and at home,” but the reality is that there is no structure of integration back into civilian life that guides vets on how to be of service. For Ryan, it was critical that he recreate a community of brotherhood at home while resourcing his sense of purpose helping others. 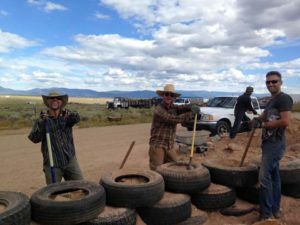 Earthship Academy Instructor Ron Sciarrillo, Ryan Wohlers (a former U.S. Army Apache Pilot), and Ryan Timmermans attending the Earthship Academy in 2015. Photo courtesy Earthship Biotecture Academy. 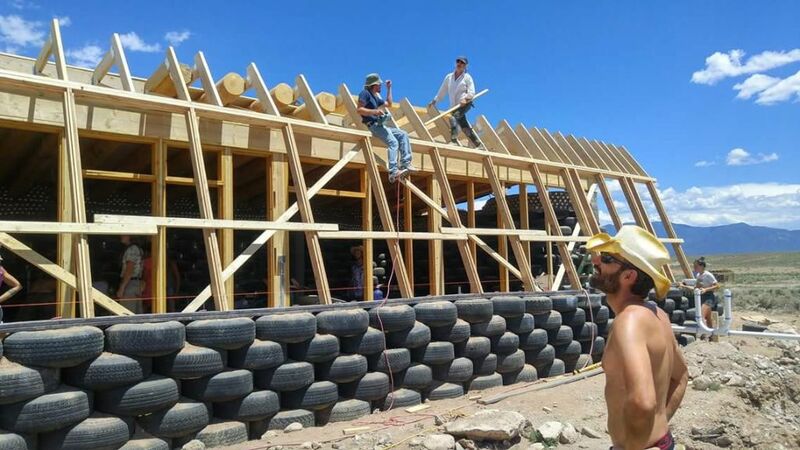 In addition to building earthships, Veterans Off-grid would introduce organic agriculture, provide a central location for therapists and healers to come (instead of calling on vets to initiate the healing from a state of PTSD, a challenge for anyone), promote entrepreneurship—including a coffee shop, food outlet, and maybe a place for the vendors who were recently evicted from the bridge. This month he bought a 50-acre piece of land and has his first vet arriving next April. He has four board members, all veterans, with about 10 veterans ready to get to work. He needs donations of all kinds—building materials, expertise, volunteers, grant writers, money. Of course, the principle goes both ways—healing our veterans, we heal ourselves. This is our community; it’s for all of us to consider what we can offer in the protection of our world, and there’s nothing quite so tangible as beginning at home. If you are a veteran who would like to get in touch with Ryan—or if you’d like to volunteer or simply want more information—visit the Veterans Off-grid Facebook page (facebook.com/VeteransOffgrid.org/). Veterans Off-grid is a 501(c)3 registered organization and all donations are tax-deductible.